Amazon is the world’s most favorite online marketplace with over 480 million products and growing; making it an opportune website to get paid as an affiliate. With all the products available to sell, you could easily pin down a few that you’d be interested in promoting. 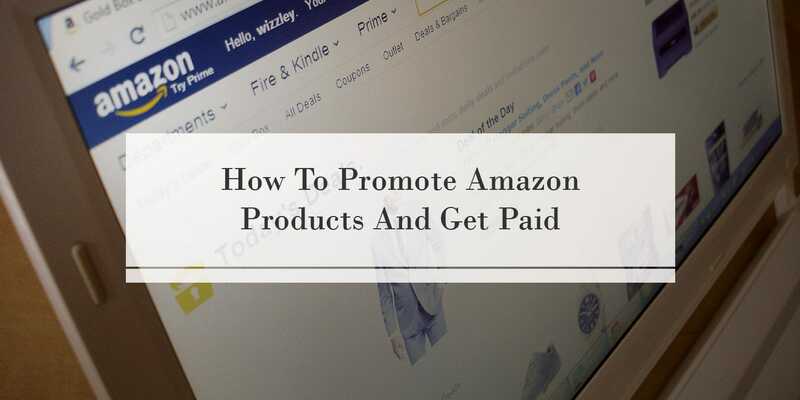 Before you do, however, you need to know that promoting Amazon products successfully will require an enormous amount of website traffic for you to make money. I’m not saying that to discourage you, but it’s important information to know so that you can set realistic expectations for your efforts to get paid as an affiliate. Amazon pays 6% to 8% commission on the sale of their products, so for every $100 you sell, you’ll get $6. That not much money if you’re an affiliate with little traffic, but if you can build a blog or website generating steady swarms of traffic you can easily create a very profitable online business. As an affiliate product promoter myself, I prefer selling products that pay 50% to 75% commission, as it takes less work to make substantially more money. I won’t go into detail about it here, but if you’d like to get more money for less work you can learn more by reading my article on online digital marketing sales. 1) Choose A Niche – As I mentioned before, Amazon has over 480 million products that you can choose to promote. To help narrow down your options, you’ll want to first pick a topic or category that will allow you to focus on selling products to a specific market. Maybe you’d like to promote health & wellness products, kids toys, or HD television sets. You can choose a category that you enjoy personally or you can base your decision on the cost of the products to get the most commission. But as you’re choosing it’s good to remember that frequency can play a big role in the amount of money you make as well. For instance, you could promote HD televisions which sell for $500+ each, but you may be able to get more frequency in your sales by selling lawn & garden supplies. So in the same amount of time that it took to sell a $500 television, you could have sold over $1000 in gardening tools. This is where conducting a little market research will help in creating profitable promotions. Learn what products are in high demand and design a promotion strategy around them. After you’ve selected your category, go a little further by defining a niche within that category. For instance, if you decided that you’d like to promote clothes, take it a bit further and identify the exact audience that you’d like to sell clothes for. Do you want to sell men’s, women’s or kid’s clothes? How about men’s outdoor clothing? Or even more specifically you can sell outdoor clothes for men over 40. Getting detailed with your niche makes it easier for you to identify with the market that you intend to serve. And the people within that market will more likely choose you as their solution. Be sure not to drill your niche down too narrow though, the niche has to have plenty of potential buyers for you to get paid. If you drill too deep you might find that there’s not enough demand to successfully sell the products that you’ve chosen. 2) Create Your Niche Website or Blog – Once you’ve identified the products that you want to promote and audience that your products will serve, it’s time to create your own niche website or blog. Every serious business has a storefront, and on the internet, your storefront is your blog/website. I suggest using WordPress as your platform because it’s a well-known software that has limitless support, plugins, and themes. A WordPress blog is extremely versatile and will expand with the growth of your business. Your blog is going to be the display area for all of the products that you promote. It’s also the place where you’ll build up the content needed to attract visitors to your site. You can write full product reviews that compare similar products, or simply write articles that will strike a chord with your target audience. Using the example of outdoor clothing for men, you could write articles about various outdoor adventures one could participate in and showcase your pick of outfits that would be comfortable on the journey. However you decide to deliver your content, this will be the core work that you’ll do to boost your traffic, get visitors, and make sales. You’ll want to provide a unique experience on your blog so that you can build loyal customers who’ll come back over and over to purchase your products. Always put your readers first by delivering recommendations on quality products and providing ample social proof showing that many have been satisfied with the products that you promote. There are many, many ways in which you can generate traffic to your website, which is a whole other topic that you’ll want to research and learn. 3) Capture Follow-Up Information – Another reason to have your own website is so that you can collect the names and email addresses of your visitors. Not everyone will buy from your site the first time they visit, so it’s important that you snag their contact information by giving away something free. It could be a free eBook, a special gift or something else that has great enough value to motivate your visitors to leave their information with you. Building an email list of prospects will be one of the most fundamental tasks you’ll do to promote Amazon products and get paid. It will allow you to build a trusting relationship with your visitors so that they’ll continue coming back to your site to purchase the products you promote. As your email list grows so will your business. And over time, you will have developed enough website content to drive a steady stream of visitors to your site that will, in turn, join your email list. Promoting products on Amazon is a great way to get paid online. With a little creativity and work, you can eventually earn a spectacular living from home. Affiliate marketing is an industry that’s exploding with opportunities. If you’d like to learn more about selling products online, take a look at this article on Online Digital Marketing Sales and start building a lucrative career on the internet. ← 3 Free Start Up Instant Work From Home Jobs!